Last November, Microsoft released the first-generation Zune to a predominantly iPod-toting nation. While the first-generation Zune is not without its devotees, the device came to epitomize Microsoft's awkwardness at marketing itself as hip. Having survived its freshman hazing, the Zune is back for its sophomore revenge, and the iPod has every reason to be frightened. 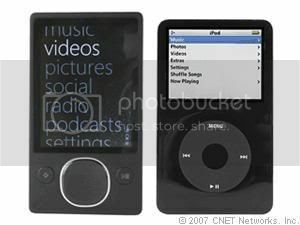 With a new design, higher capacity, wireless sync capability, larger screen, and integrated support for audio and video podcasts, the new 80GB Zune ($249) is finally giving everyone a true alternative to the iPod.